Parker, AZ (June 29, 2018) - Nautique has teamed up with The World Wake Association (WWA) to host the 2018 Nautique Southwest Regatta. This Regatta is an exclusive experience for Nautique boat owners that’s FREE* to all who attend and will take place September 14th- 16that the Blue Water Resort and Casino in Parker, Arizona. 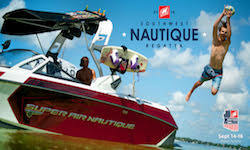 This Regatta will be unlike anything Nautique boat owners or their families have ever experienced before. It will be an action-packed, fun weekend both on and off the water with an array of exciting activities. Attendees will be able to participate in private demos/clinics with Team Nautique athletes, a Poker Run, a kids waterski, wakeboard and wakesurf contest, a golf tournament and a themed dinner/awards ceremony for the entire family, just to name a few. *Attendees will need to pay for their accommodations and trailer parking. **Athletes attending the event are subject to change. Apparently, the pros will hop on your Nautique when you head out for a run, and give you real-time tips. What a great event!!! The weather in Parker always seems to be perfect in September. If my boat gets repaired in time, my kids want to go.